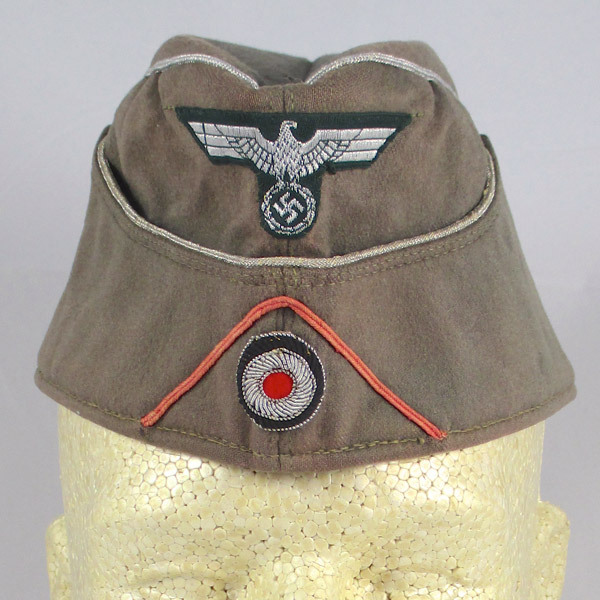 There were several styles of headwear worn by members of the German Heer and Luftwaffe during World War 2. 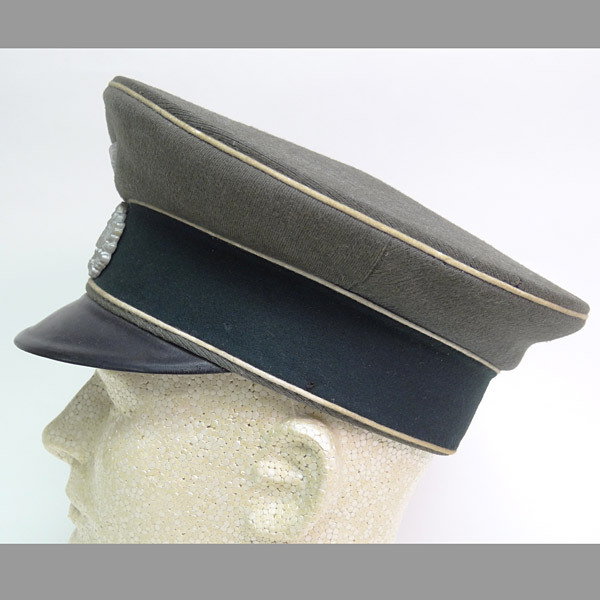 Soldiers in the Heer (or German Army) wore feldgrau (field grey) side caps which were soft folding caps fashioned from wool. 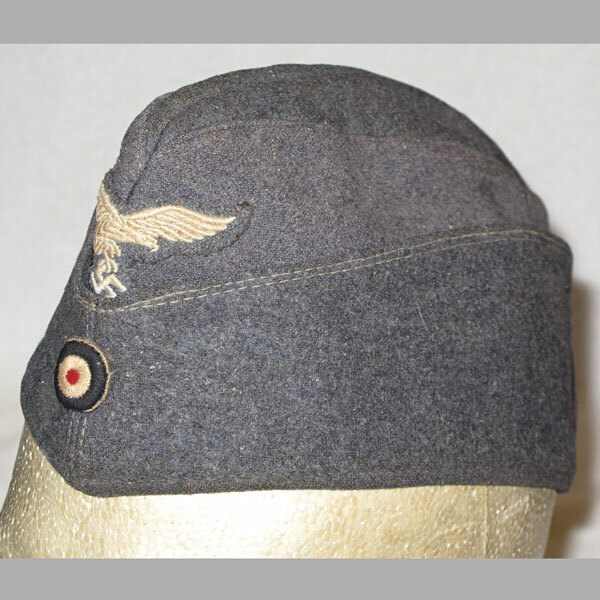 They were very similar to American garrison caps (sometimes referred to as overseas caps) save for the German side cap’s scoop in the front. 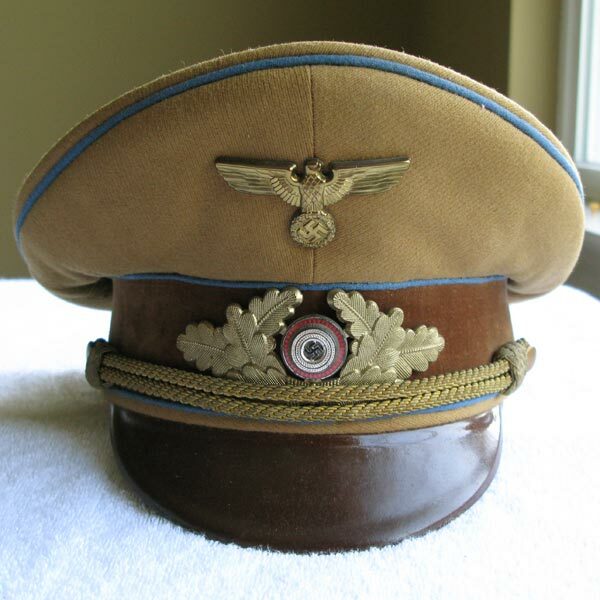 Heer officers’ side caps featured silver piping which served to distinguish the officers from enlisted men. 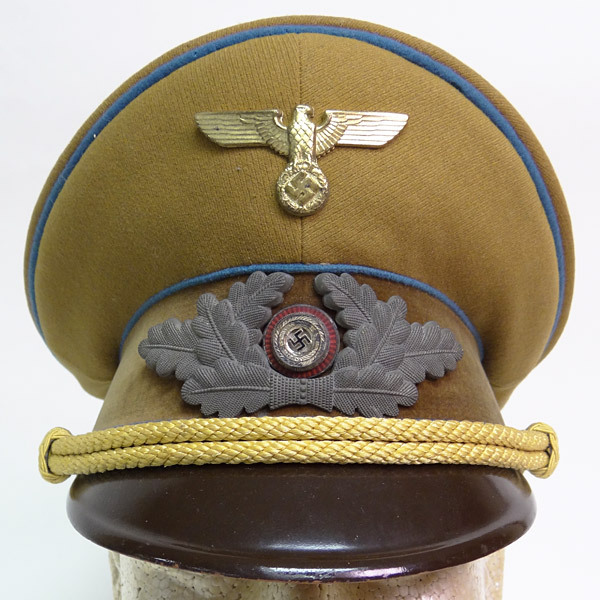 The sidecaps worn by generals were piped in gold. 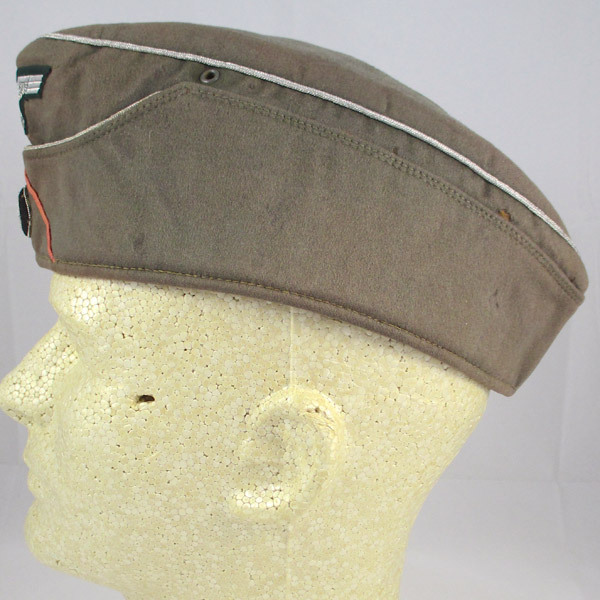 In 1942 a variation of the sidecap was created with a button-secured dual fold that functioned as ear flaps. Shortly thereafter this hat was effectively replaced by the M43 visored field cap. 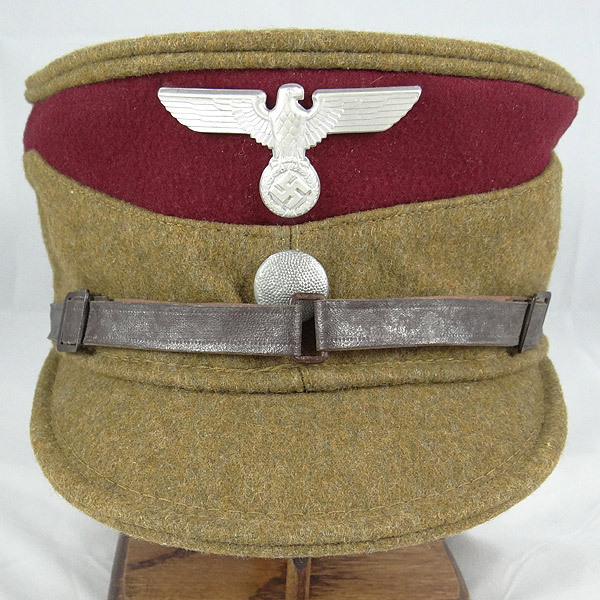 This was also a soft wool cap and it rapidly became the standard headgear for Heer soldiers. 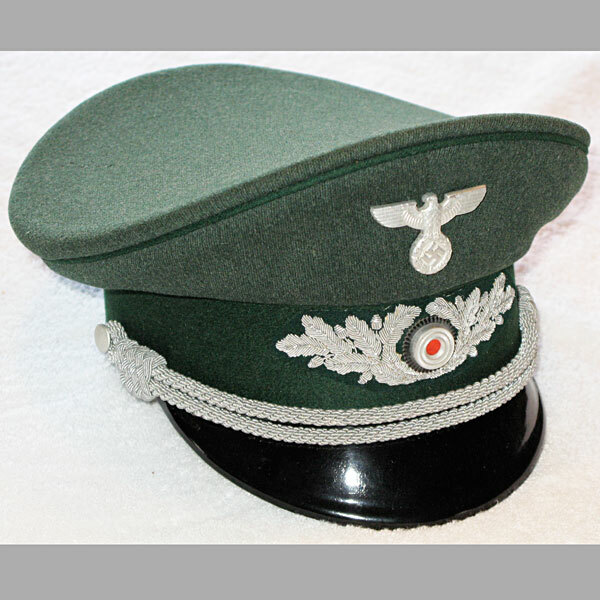 The standard cap worn by officers and enlisted men in the Heer and Luftwaffe for more formal matters was the visor cap or peaked cap. 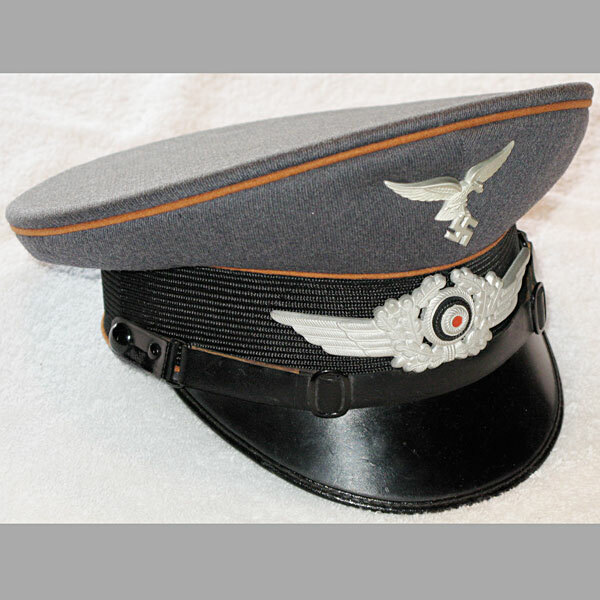 The rigid visors of these caps were made primarily from black vulcanized fiber with some versions fashioned from patent leather. 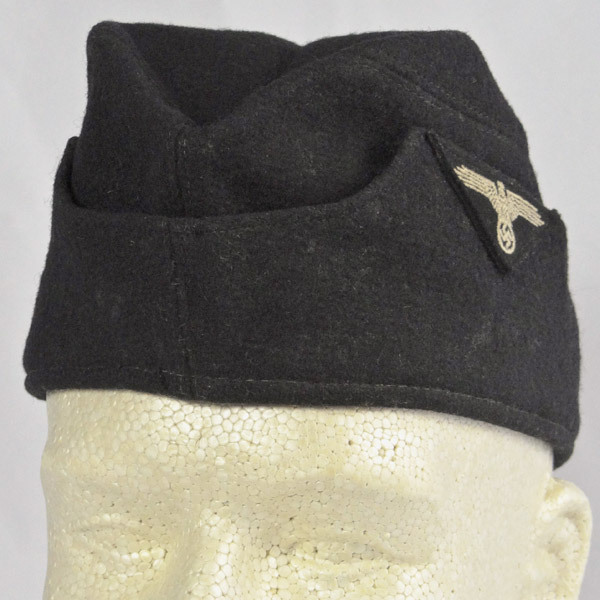 The visor caps issued to enlisted men had a black leather chinstrap while those issued to officers and authorized NCOs featured braided silver cords. 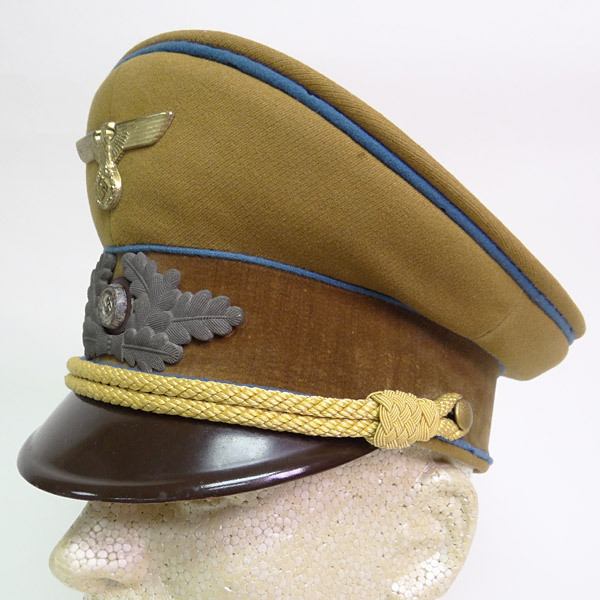 A general’s visor cap had gold braided cords. 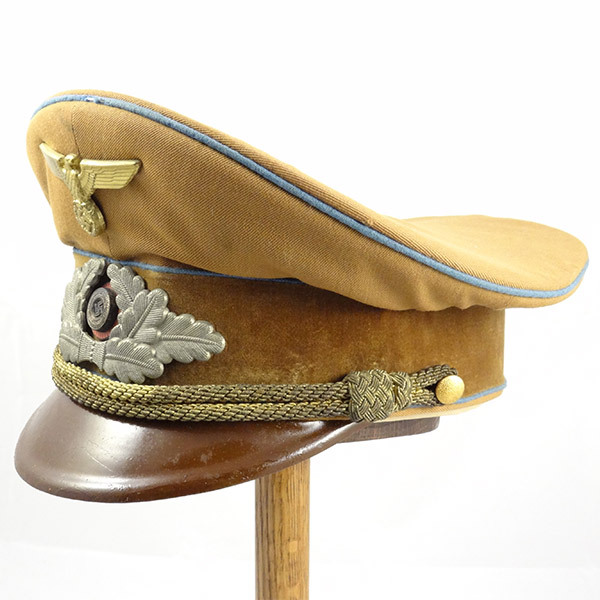 Check back often as our selection of German WWII Caps and Visors is updated quite often with new items! 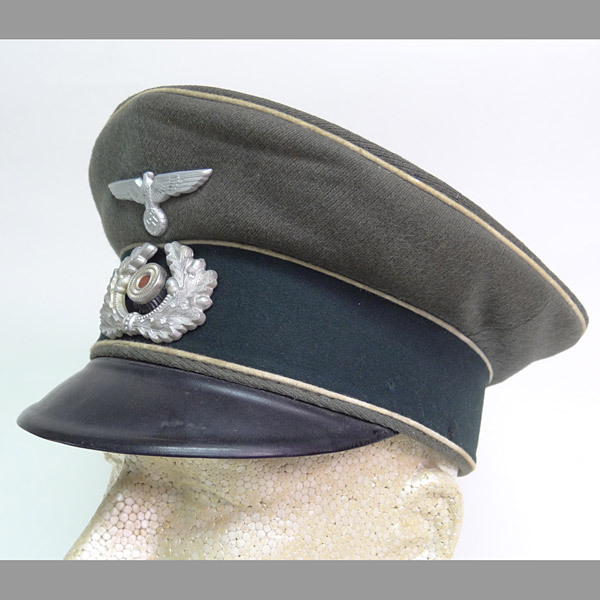 This is a very hard to find Field Gray version of the M38 Panzer Officer Overseas Cap, named to “J. Schlieckmann”. Typically these are found in black, but this field gray version is seldom seen, and much less often in the officer version. 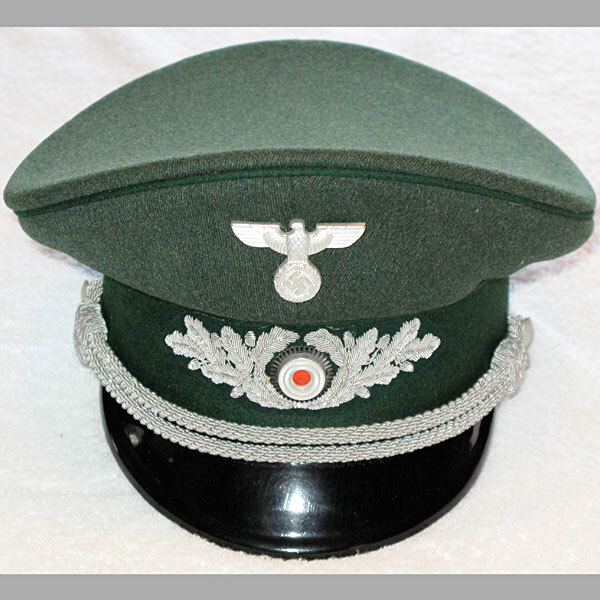 This cap is shown on page 94 of Pat Moran & Jon Maguire’s book, “German Headgear in World War II”. 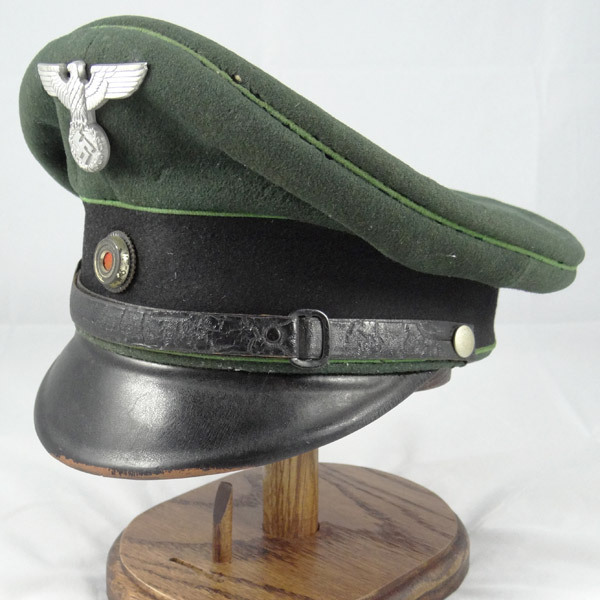 This is a very high quality, and immaculate WWII German State Forestry (Heeresforstverwaltung) Officer’s named visor cap, manufactured by Karl Schlipf Uniformgeschaft Backnang. It simply doesn’t get any better than this. The exterior condition is like new, with hardly a blemish, while the interior appears as if the cap was worn only a handful of times. A collector’s dream! 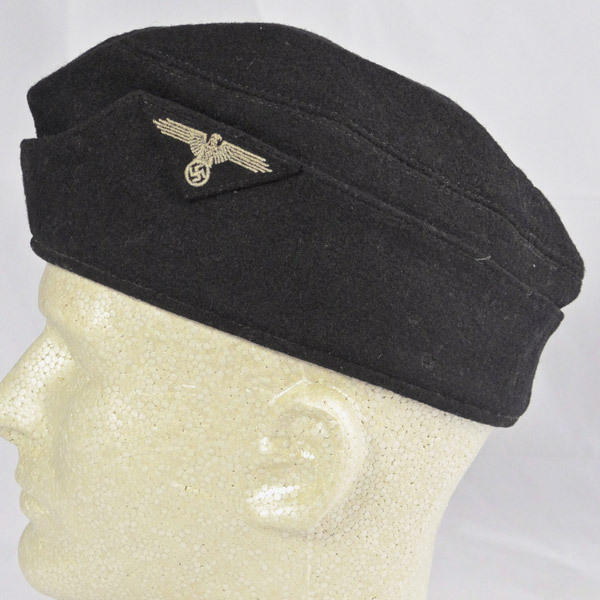 This WW2 NSDAP Political Visor Cap is in very nice condition, with only minor moth nips to the blue piping (fairly normal and expected), and some minimal staining on the interior, evident in the photos. The cloth overall is in like-new condition, with no notable stains on the exterior, and as stated above, only minor water (sweat) stains on the interior top fabric of the cap. The dark brown band around the rim is absolutely 100% with no moth holes or nips whatsoever. Same with the light brown fabric, no notable flaws. 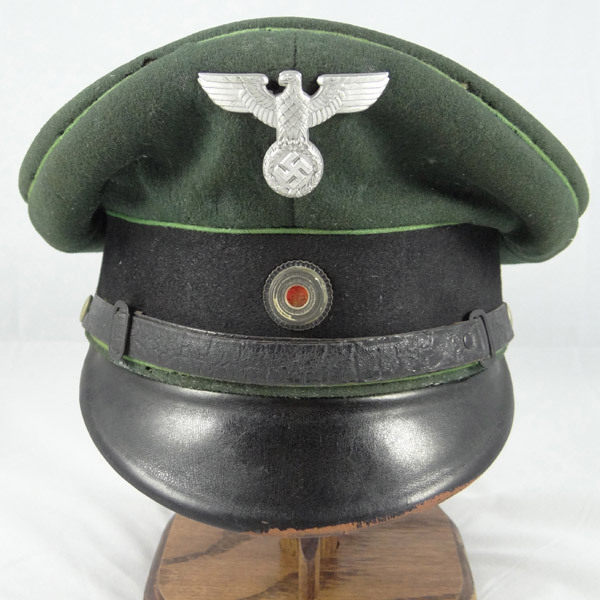 This is a very nice quality example WWII NSDAP Visor Cap, in very well preserved condition. 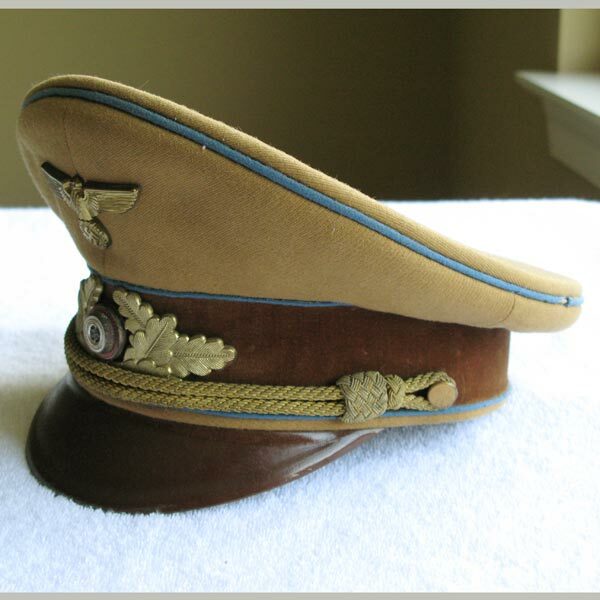 Aside from a couple very minor moth nips to the light blue colored piping around the rim, and a 4 inch section of the sweatband that has come loose (unnoticeable unless you pull the band away from the rim), this is a solid World War 2 Political Visor Cap. 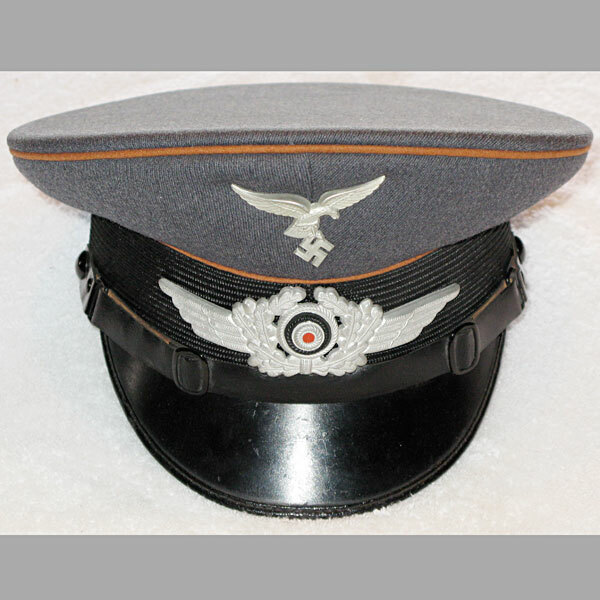 A very nice, clean and well shaped example of a Luftwaffe Signals enlisted & NCO ranks Visor Cap manufactured by the scarce maker, Ostland (Freiburg Schlesien 1939). Second pattern insignia in bright aluminum above a chinstrap of black patent leather. Very minor scuff marks to the visor and chinstrap, interior is in pristine condition, with no cracks in the plastic or sweatband. Overall excellent condition. 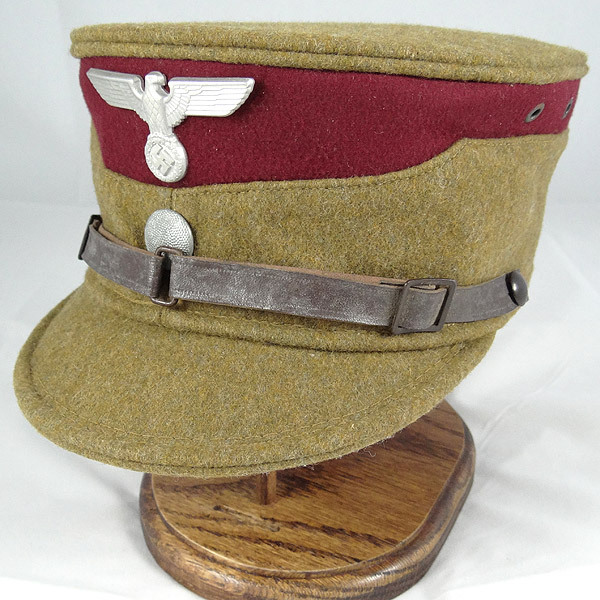 Early Wehrmacht period, older style teller shape WW2 German Infantry Visor Cap. 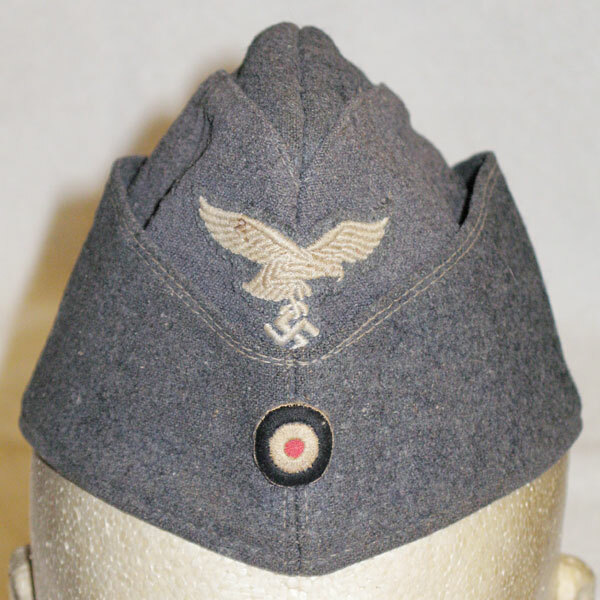 This cap was purchased without the Eagle, but care was taken to reattach a matching aluminum-style eagle in the same location as the original pin holes. 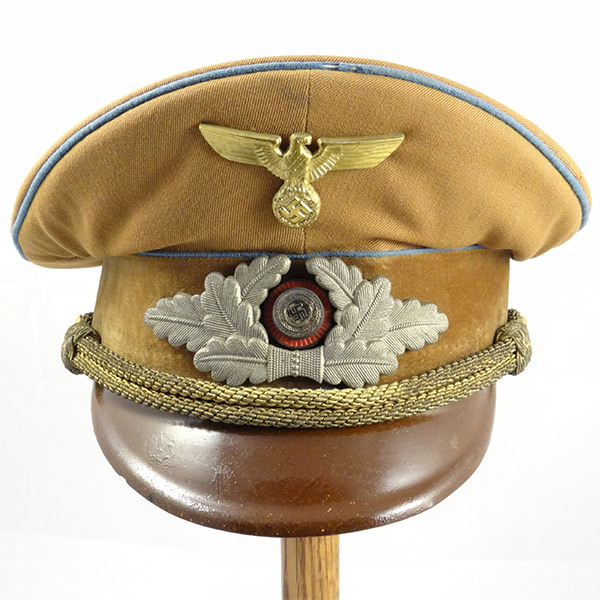 A WW2 Luftwaffe Overseas cap for an Enlisted Man or NCO in fair condition, showing signs of mothing throughout (thinning of the fabric), as well as one notable moth hole. There is also a small stain in the eagle emblem’s right-hand wing, visible in the photos.